Are you serious about switching to solar energy but don’t know how to take the next step? From face-to-face consultations, to bespoke design, to installation and maintenance, SOLTERRA CAPE/WEST COAST can help you start your solar journey and guide you through the process of switching to renewable energy technologies. 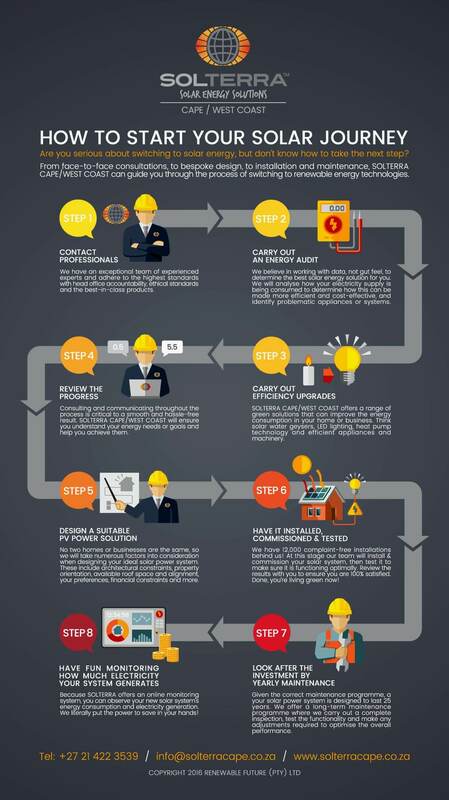 Our infographic below takes you through the solar journey step-by-step. At SOLTERRA CAPE/WEST COAST we have an exceptional team of experienced renewable energy experts. We adhere to the highest standards with head office accountability, ethical standards and the best-in-class solar products. We believe in working with data, not gut feel, to determine the best solar energy solution for you. Our team will carry out an energy audit to analyse how your electricity supply is being consumed, determine how it can be made more efficient and cost-effective, and identify problematic appliances or systems. SOLTERRA CAPE/WEST COAST offers a range of green energy solutions that can improve the energy consumption in your home or business. Think solar water geysers, LED lighting, heat pump technology and efficient appliances and machinery. Consulting and communicating throughout the process of switching to renewable energy is critical to a smooth and hassle-free result. SOLTERRA CAPE/WEST COAST will review the progress of your solar journey regularly to ensure you understand your energy needs and goals, and help you achieve them. No two homes or businesses are the same, so we will take numerous factors into consideration when designing your ideal solar power system. These include architectural constraints, property orientation, available roof space and alignment, your personal preferences, financial constraints, and more. We have 12,000 complaint-free installations behind us. At this stage our team will commission your solar system, review it with you, install it once you are satisfied and test it to make sure it is functioning optimally. Done, you’re living green now! Given the correct maintenance programme, your solar power system is designed to last 25 years. We offer a long-term maintenance programme where we carry out a complete inspection, test the functionality and make any adjustments required to optimise the overall performance on a regular basis. Because SOLTERRA CAPE/WEST COAST offers an online monitoring system, you can observe and monitor your new solar system’s energy consumption and electricity generation. We literally put the power to save in your hands! Ready to get started? Contact us today by emailing info@solterracape.co.za or calling us directly on +27 21 422 3539.